As part of the “Pop to School” Trunk Show, the New York retailer is proud to launch the new KarmaPops, with $5.00 from every sale donated to the KLEO Organization. Also, purchases of $200.00USD or more in JewelPops are eligible for a limited edition Kameleon JewelPop gift. With every purchase, JewelPop will donate $5.00USD to the KLEO Organization. A Silver Breeze is proud to launch the new KarmaPops as part of the “Pop to School” Trunk Show. With every purchase, JewelPop will donate $5.00USD to the KLEO Organization (Karen Learning & Education Opportunities). The enamel coloured KarmaPops are interchangeable with all Kameleon jewelry. The KLEO Organization began with its founder Coleen Scott’s trip to Thailand with her daughter Jen. The two visited the Karen people in North West Thailand, and Jen decided to continue teaching there until her untimely death in 2003. In 2009, Coleen founded the residence, Jen’s House, in honour of her daughter and the work she did. The residence allows students living in remote villages to continue their education in a good quality school. The proceeds donated by JewelPop will be used to support Jen’s House. 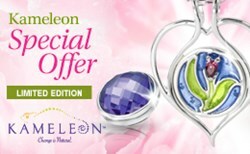 A Silver Breeze is also excited to launch the Kameleon Pendant Promotion. With every purchase of $200.00USD or more in JewelPops, customers will receive a free limited Edition Kameleon pendant and sterling silver chain, with a retail value of $129.00USD. Every limited edition pendant comes packaged in a custom Kameleon box. The Kameleon Pendant Promotion and new KarmaPops are now available. For more information and to purchase products, please visit A Silver Breeze in store or online at: http://www.asilverbreeze.com. A Silver Breeze was founded with a philosophy in mind: give women the freedom to be themselves and embrace a sense of style that’s unique to each woman. A Silver Breeze offers women quality sterling silver jewelry that is interchangeable, from brands like Kameleon, Chamilia, Bella Ryann and Lenny & Eva. You will also find gifts and other accessories from brands like Natural Life, WeWOOD and Bering Watches.